Thunderstruck II is the sequel of the popular slot, Thunderstruck. Thunderstruck is a five-reel 243-ways-to-win slot game that has incredible bonuses and exciting features that will get every slot fan excited. 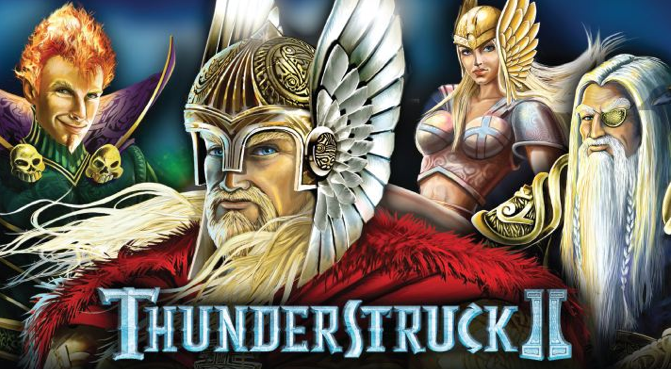 Thunderstruck II has been developed by the world’s biggest game developer, Microgaming. Microgaming is known for its massive jackpots and high quality graphics. The game is available in almost all online casinos powered by Microgaming. The game has incredible graphics and animations. The game is introduced under the background of lightning and thunder. The introductory clip is a summary of all the unique features and the characters featuring in Thunderstruck II. Thor – the hammer-wielding god and the god of thunder. All the gods in Thunderstruck II have distinctive features that reward differently. Depending on the character you pick, you will be rewarded with a different number of free spins and multipliers. Asgard the home to Odin and the capital city of the Norse gods also makes an appearance. The conventional high-value cards are used in Thunderstruck II. Card symbols; 9, 10, J, K, Q and A are artistically carved from hard rock and marble. All the themed symbols are brought to life using animations borrowed from the original comic. Valkyrie is seen riding on her white horse wielding a spear in her hands. Loki displays his mischievous trait with a twirling green fireball and flaming hair. Thor is seen pumping his magic hammer ready to strike. Odin is seen with his ravens hovering around. Thunderstruck II has a flexible coin range to suit all budgets. The coins denomination starts at 0.01 to 0.25. Thunderstruck fans have the option to wager up to ten coins per pay line. In the case of a winning combination, the number of coins wagered per line is multiplied by the line payout in the pay table. Since the game uses the 243-ways-to-win, there’s no need to worry about the number of active pay-lines. The wild symbol in Thunderstruck II is the logo. The Thunderstruck logo can replace all other symbols in Thunderstruck II except the scatter symbol. The logo also carries a 2x multiplier for all the winning combinations it features. The wild symbol pays a fixed jackpot of 1,000 coins. Thor’s hammer plays scatter in Thunderstruck II. When you bag two or more Thor Hammers, you unlock the scatter payouts. Three or more Thor hammers activate the Great Hall of spins. In the Great Hall of spins, you get four free spins. Other free spins are available in the different themed features of the game.